Steam Jet Heaters utilize the principal to mix steam with a cold liquid uniformly. Operation is efficient because the heat in the steam is absorbed by the liquid being heated to approximately 10% of liquid saturation temperature. The jet action produces agitation and circulation, eliminating the need for other equipment to accomplish these functions in most applications. Basically, all of these Jet Heaters have a nozzle or orifice arrangement, a diffuser, and body (which in some cases consists only of bracing to hold nozzle and diffuser in position). In operation, jet heaters use steam (or steam and water under pressure) as the motive force to entrain, mix with, heat, and pump (or circulate) the suction liquid. The liquid under pressure attains a high velocity passing through the nozzle. Steam enters through a series of nozzles in the combining tube and an intimate mixing of the liquid and steam occurs in the throat region. The liquid absorbs all of the heat of the steam. Under normal conditions no loss in water pressure occurs. In certain cases, this water can be operated against back pressures higher than either the supply water pressure or steam pressure. These heaters can eliminate mechanical pumps, resistance or bayonet heaters and containment vessels. These units have a low initial cost, limited moving parts and are easy to install and require little or no maintenance. Simplex pipeline heaters combine liquid under pressure with steam at a higher pressure. Pressurized liquid enters the heater and flows through an in-line perforated combining tube concentric to the diffuser. Steam enters the heaters and intimately mixes with the liquid in the tube & venturi. The steam complete condenses and heats the liquid. There is no pressure drop across the heater. Tank Steam Heaters are used in vessels where the direct contact of steam with the liquid to be heated is compatible with the process. Tank heaters provide economical heating as well as thorough agitation of the liquid. Tank steam heaters submerged directly into the liquid to be heated. There is no practical limitation to the volume that can be heated. Tank steam heaters offer improved performance over conventional sparger pipes and provide more vigorous agitation using fewer pipe openings. The large open suction passages of the tank steam heater accommodate clean liquids as well as slurries. Several types of Steam Jet Heaters are available. Although their designs vary, the operation of each is based on the jet operating principles of the jet pump. Typically, a steam jet heater includes an inlet for the liquid to be heated, a steam inlet (suction) where steam is introduced under pressure, and a discharge where the heated liquid and condensed steam leave the heater. 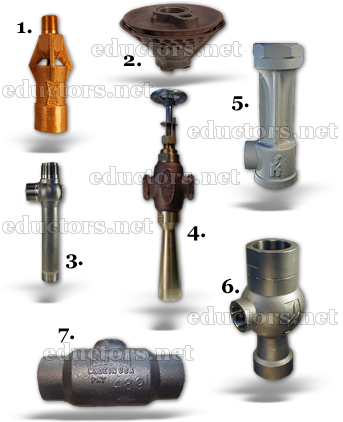 (These correspond to the inlet, suction and discharge of a jet pump.) Compare the cutaway illustration of a jet pump to the illustrations of jet heaters on these pages to help clarify some of the similarities between jet heaters and jet pumps. Steam Jet Heaters offer many advantages: They have no moving parts, nothing to break or wear. There are no packing glands. No lubrication is required. The initial cost is low. Installation cost is low because they are compact and no foundation or wiring is necessary. They provide reliable operation with low maintenance cost. There are numerous possible applications for Penberthy Steam Jet Heaters. Heaters are available for heating liquids in line or in a tank. Steam Jet Heaters are commonly found in these industries: food processing, petroleum, dairy, manufacturing, chemical, distilling/brewing, and others. Specific applications for inline heaters include: circulating cleaning solutions, pasteurization, producing scalding sprays, sterilization, heating water, blanching, exchanging heat, degreasing, heating slurries, laundering, cooking, pickling, bonderizing, quenching and tempering. Specific applications for open tank heaters include cooking grain, cooking mash, cooking starch, heating and circulating, mixing. Steam is supplied in a gaseous state. Heat transfer with saturated steam utilizes the latent heat of steam, releasing a large amount of energy as it condenses (changes to the liquid state). The amount of energy released per unit of steam is high (up to 539 kcal/kg, or 970 Btu/lb, and higher with vacuum steam). Utilizing latent heat (steam heating) for heat transfer is far more effective than utilizing sensible heat (hot water or oil heating), as a much higher amount of energy is released in a shorter period of time. How Does Steam Provide Stable, Even Heating? Unlike heat transfer by convection (e.g. hot water), heat transfer by condensation (e.g. steam) does not involve a temperature change. When steam condenses on the heat transfer surface, it passes on its latent heat to the product. The condensate then formed still contains its sensible heat, so it is of the same temperature as the steam from which it was produced. This enables even heating across the whole heat transfer surface. If the pressure at the heat transfer surface (e.g. jacket, shell or coil) of the equipment is held constant, continuous heating at a constant temperature can take place throughout every part of the heat transfer surface. On the other hand, with hot water or oil heating, the temperature of the heating medium is reduced as sensible heat is transferred from the heating medium to the product. The temperature gradient is therefore constantly dropping because each unit of heat transferred will also lower the heating medium’s temperature. This can result in uneven heating, which may adversely affect the product being heated. How Does Steam Provide Rapid Heating? The secret is in the transfer of heat resulting from the process of condensation. The latent heat contained in steam is released the instant steam condenses into the liquid state. The amount of latent heat released is 2 to 5 times greater than the amount of sensible heat available from hot water (saturated water) after condensation. This latent heat is released instantaneously and is transferred through the heat transfer surface to the product being heated. Through condensation, steam naturally flows against the heat transfer surface. This helps speed the heating process. In contrast, hot water and oil transfer heat by convective heating, which does not involve a change of state. If left to natural convection, heat transfer is extremely slow. Thus, a pump is typically used to create flow against the heat transfer surface to increase the rate of heat transfer. This is known as forced convection heating.